The ideation workshop is the perfect place to let your creative juices flow and come up with an innovative idea. See you at Impact Hub Phnom Penh between 5.45-8pm next Tuesday. Registration and details for the workshop can be found HERE and HERE respectively. Geeks in Cambodia is proud to be an outreach partner of Impact Hub Phnom Penh’s Urban Mobility Incubator, their latest programme for businesses focused on the future of transportation, mobility, and road safety in Phnom Penh City. Supported by Grab and UNDP, if your idea is one of the eight selected, you will receive six months business incubation including business mentoring and coaching support from local and international mentors. Three exceptional teams will then be selected to go onto a 3-month Investment Readiness Fellowship to take their ideas to the next level. “We are looking for the most ambitious and dedicated entrepreneurs with ideas in urban mobility and transport that can help us move Phnom Penh towards becoming a smarter city for all,” said Kosoma Kim, Communications Manager at Impact Hub Phnom Penh. 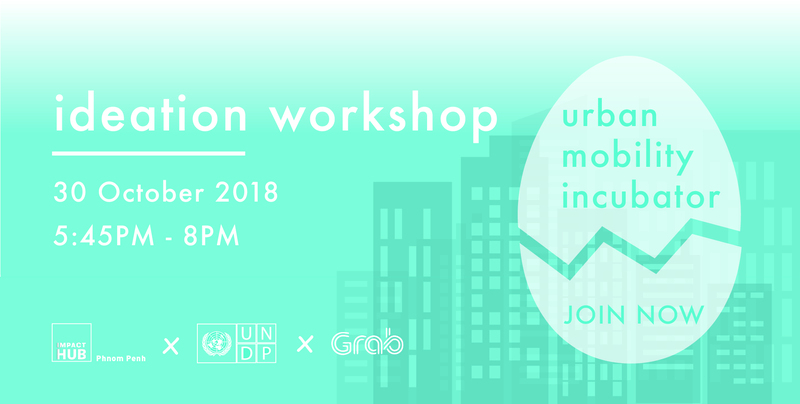 The Urban Mobility Incubator is part of a larger partnership with the Ministry of Public Works and Transport (MPWT) known as the Sustainable Urban Mobility for All Initiative (SUMAI), created by UNDP and supported by GRAB. “Recognising the fundamental role of sustainable transport in achieving the future we want, the SUMAI project aims to support integrated sustainable urban transport solutions by reinforcing national capacities and systems strengthening, while stimulating innovations in smart transport solutions to accelerate progress on safety and mobility for all”, explained Nick Beresford, UNDP Cambodia Country Director. So sign up if you’re an aspiring entrepreneur who hopes to help solve some of Phnom Penh’s mobility challenges. More information and registration for the Urban Mobility Incubator can be found HERE and HERE respectively. Signups for the incubator close on the 26th of November.